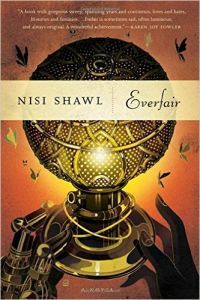 Nisi Shawl’s debut novel, Everfair. is a fantastically intricate portrayal of the birth of a free state in the heart of Africa and its fight for survival against the brutal regime of Belgian King Leopold. The classic steampunk tropes of Victorian Britain are transported to the burgeoning state of Everfair and the neighbouring Congo and adapted to the tropical climate and local materials and culture.